but a "who is going to catch one today?" fish. Anyone who has caught a 45 inch PLUS Northern Pike will tell you that they are truly in a class by themselves. When your rod tip stays steady and then dives straight down...it's a good bet you have a giant on the end of your line. Silsby Lake and our outpost camp lakes- High Hill Lake and Cuddle Lake give our anglers a much better chance at catching these giant Pike. Guide Richard Watson holds up Ria Plaizier's 50 inch Northern from Silsby Lake. 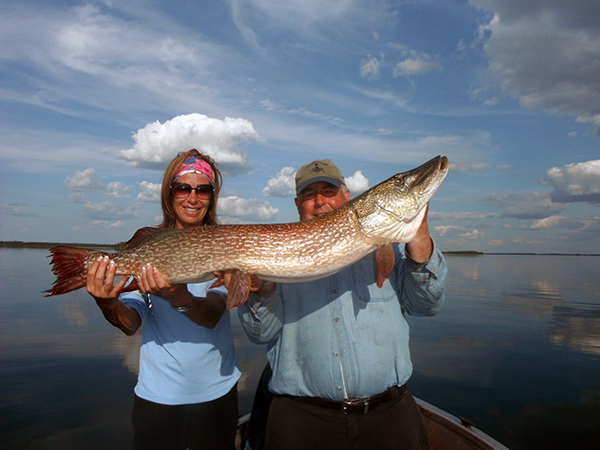 Ria had never fished for Northern Pike and caught in on the 2nd day of her four day trip in late August. Check out the head and girth on this monster! There are not too many lakes in Canada that can still produce these kind of fish. Spring time fishing at Silsby produces a lot of trophy Pike. These giant fish will be found in the shallows (2-10 ft. of water) for the first few weeks after ice out. There is a lot of sight casting done during this time period as our waters are crystal clear. They can be "finicky" at times, but when they turn on...they really turn on. Guests have caught dozens of trophy Pike at this time during their stay. The weather can be "finicky", as well, so fishermen should bring layered clothing with good quality raingear. GuideGuiggggggStrict conservation policies over the last 26 years is the only reason these giant Pike are still around. And because of our continuing conservation policies...they will be around for generations to come. We are the only lodge operating with a single barbless hook (per lure) policy. This ensures a quick release without damaging the vital gills, etc. during your long fight to the boat. We also use only cradles which help in protecting the fish from being wound up in a net and keep it in the water while taking out the hook, etc. We are a strict catch and release lake with all Pike 26 inches and over released. No take home fish are allowed to leave Silsby. 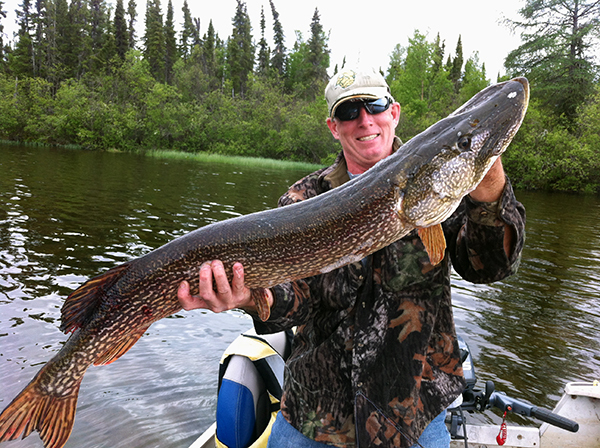 The Fall Frenzy in late August is a great time to fish for Giant Pike. The "Hawgs" are feeding hard this time of year and are usually found in shallow water near reefs, or on the edge of weedbeds. The weather is very stable this time of year and temps and bugs are very reasonable.